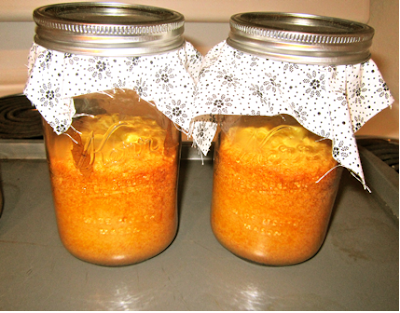 --I found this super cute idea of baking a cake in a jar. This would make a great gift idea for the upcoming holidays. All you need is cake mix of your choice with all of the ingredients to go with it, jars like the ones below, and anything cute to decorate the cake with, when it has cooled. Hop on over to Crafty Texas Girls to see this awesome tutorial. Super easy and super cheap. I had no idea doing "bunting" was so easy and so cute. This crafty idea would be great for a little one's first birthday party or even a baby shower. You can even add pictures on each one to make the craft more personalized. You use any type of scrapbook paper you might want and then cut it in a way that the paper looks like fabric. Head over to Crafty Texas Girls to look at this easy bunting tutorial. This next idea is one of my personal favorites and is yummy too! I have to show you this picture!! What kiddo (or mommy) would not love to eat these? These candy corn cupcakes are really simple to make and did I mention they look yummy? Thank you Sugar Turntable for this awesome cupcake recipe. Cake balls are some of my favorites during the holidays and are very simple to make. They are always a big hit at my husbands family get togethers as well as my side of the family get togethers. This recipe gives you the great taste of cake balls but with a holiday festive look. 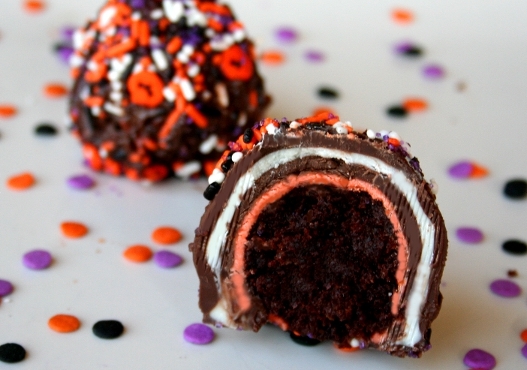 These are layered cake balls and these would be so cute for Thanksgiving or Halloween. You could even change the colors to red and green for Christmas. Check out Sugar Turntable for step-by-step instructions. I wish so much that I knew how to sew and make things out of fabric. 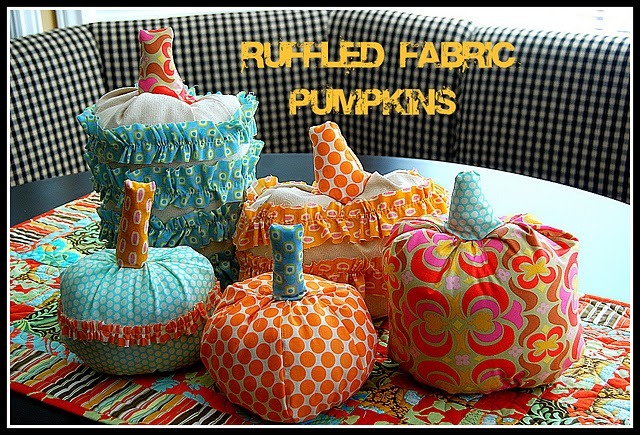 These fall ruffled fabric pumpkins are really, really, really cute. I am always looking for things like this to go on sale at Hobby Lobby, but these are fairly easy for someone who, well... knows how to sew. Tatertots and Jello give you step-by-step instructions to help you make these very cute fabric pumpkins. This is a must in my book for the fall season and you can use them for years to come. No way. 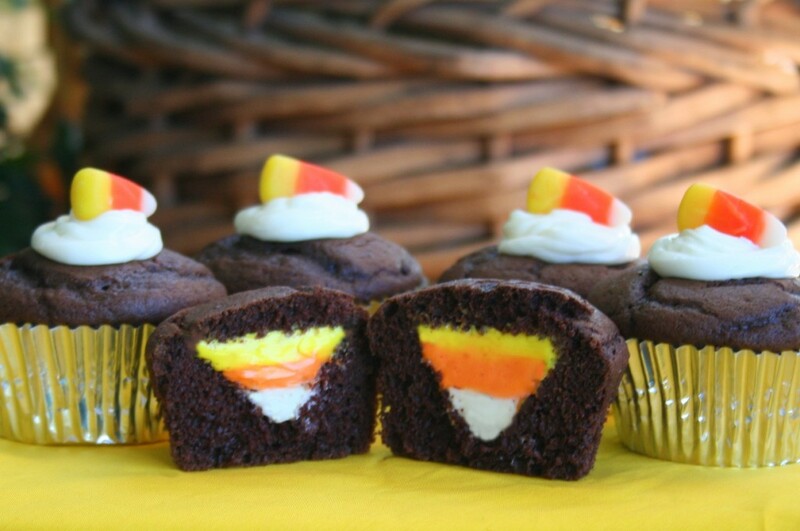 Those candy corn cupcakes rock!! I would love for you to share this post of fall craft ideas over on my mommy solution linky party! Can't wait to try these crafts. Thanks for the follow on Twitter. I have returned the favor. Have a great day. Thanks for linking up on my Follow Me Friday's post! Love these fun fall ideas! I could eat all of those candy corn cupcakes - yummo! Thank you so much for linking up at Taking A Timeout Thursday! Cakes are one of my favourite things and here are 3 ideas to try out! The cake in a jar is quite inventive.